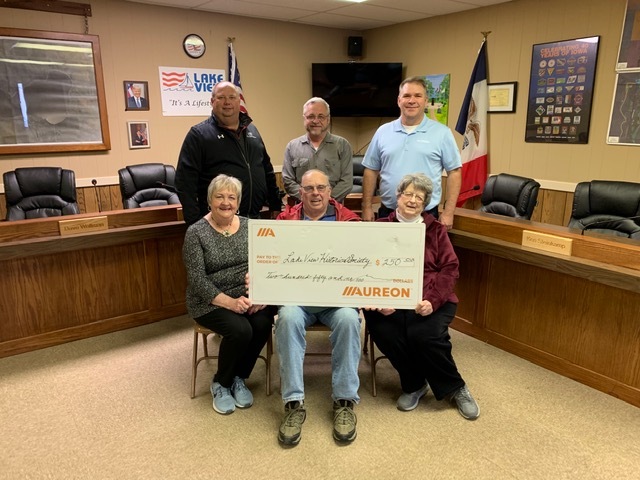 Aureon and Corn Belt Telephone were proud to present a $250.00 grant to the Lake View Historical Society Friday, March 18th, 2019. The funds will be used for new museum brochures. Aureon and Corn Belt Telephone Company are committed to advancing Iowan communities and recognize the Lake View Historical Society for their passion for the betterment of their neighborhood. Pictured left to right, top row: Lee Wuebker, General Manager of Corn Belt Telephone Company, John Westergaard, Mayor of the City of Lake View, and J.D. Siebert of Aureon, and left to right, bottom row: Jane Croll, Richard Stoffregen, and Marilyn Keiser of the Lake View Historical Society.